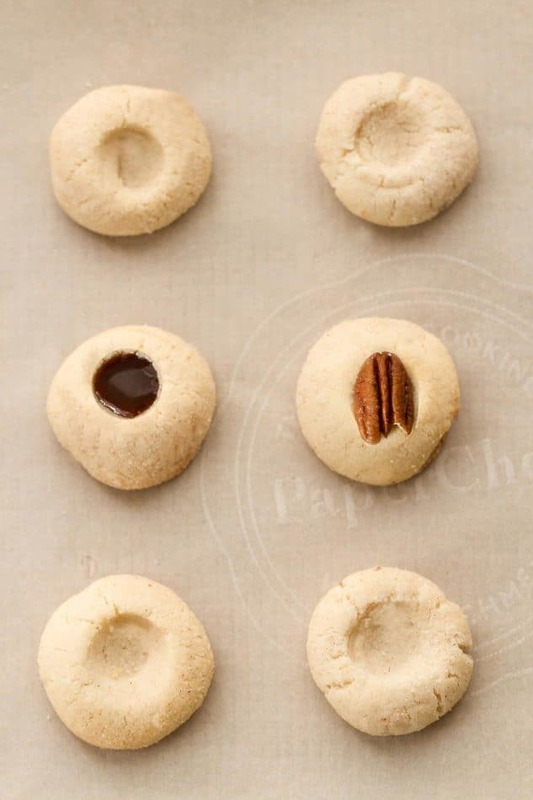 Easy Shortbread Thumbprint Cookies | 7 Versions for Holiday Baking! 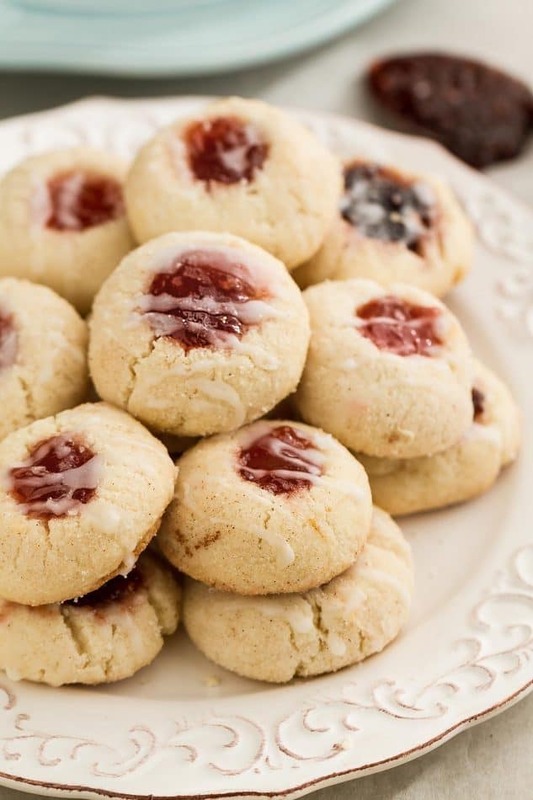 Shortbread Thumbprint Cookies – 7 Ways + Video! 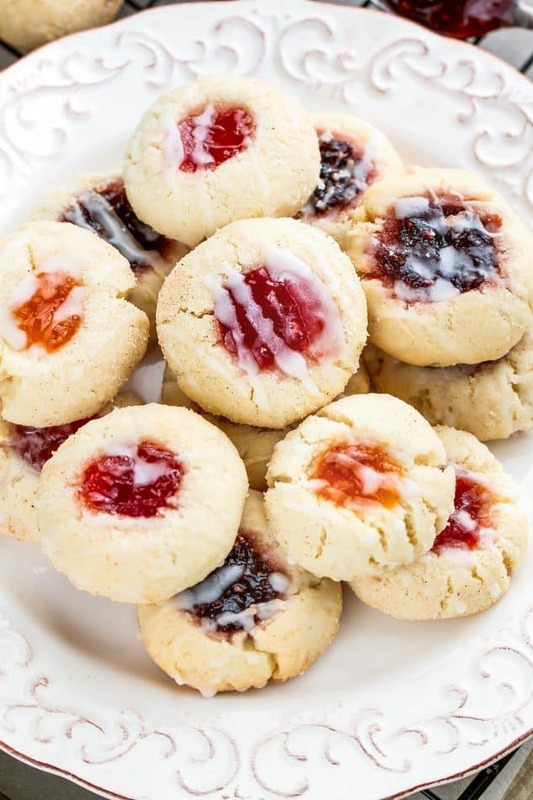 5 Ingredient Shortbread Thumbprint Cookies – my favorite dough for making these classic cookies! Best of all there’s NO CHILLING required & cookies do not spread! 7 fun ways to decorate perfect for your holiday cookie platter with a step-by-step video! It’s December and that means it’s officially cookie baking season. It’s our most favorite time of the year and I always seem to get carried away with how many treats I end up making. I can’t help it, snowballs, caramel corn, sugar cookies, fudge – they’re all so much fun to make! 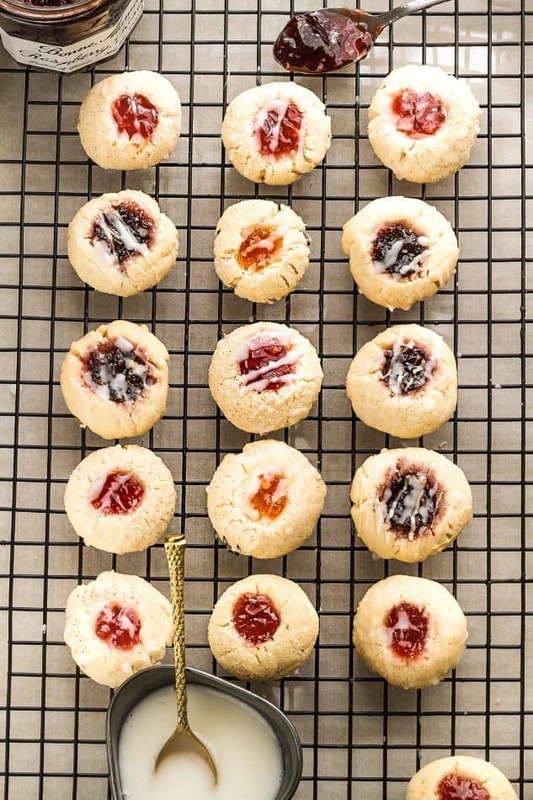 One of our favorite cookies we make every year are Classic Jam Thumbprint Cookies or what I like to call sugary bites of bliss. I can never seem to get my act together to photograph them in time since they always get snatched up as soon as I make them. They start off with a buttery, melt in your mouth shortbread base. I love this dough because it you don’t have to worry about the cookies SPREADING at all when you bake them and best of all – NO CHILLING required!! and my secret ingredient?? Cornstarch….the key to keeping the cookies nice and soft with absolutely no spreading. Next, you can either leave them plain or roll them in some sugar for some added texture and crunch. I usually like to add a touch of cinnamon as well but they are totally delicious if you decide to leave out that step. And even better, you’re not just limited to fruit. I have 7 fun ways for you to decorate them and be the star at any holiday cookie exchange party! 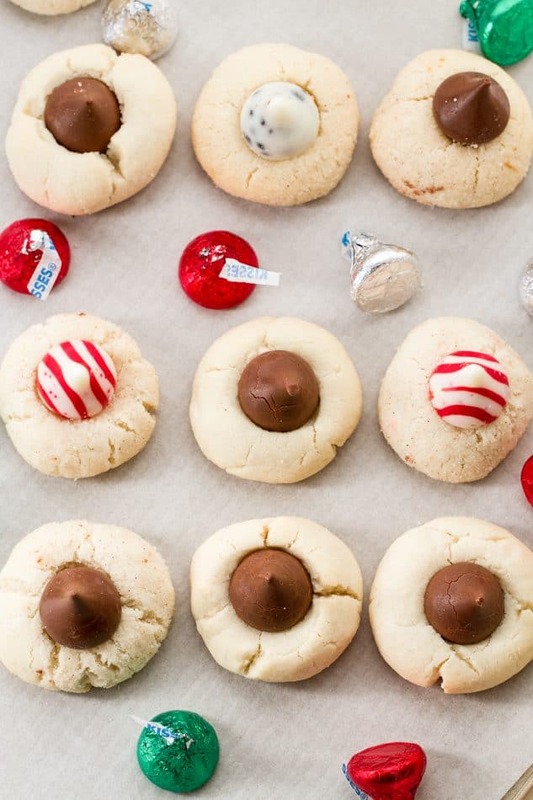 For these Hershey’s Kisses cookies, just be sure to press the Hershey’s Kisses into the cookies as soon as they come out of the oven – then allow them to dry and set. Use your favorite Hershey’s Kisses – peppermint, chocolate or cookies and cream! 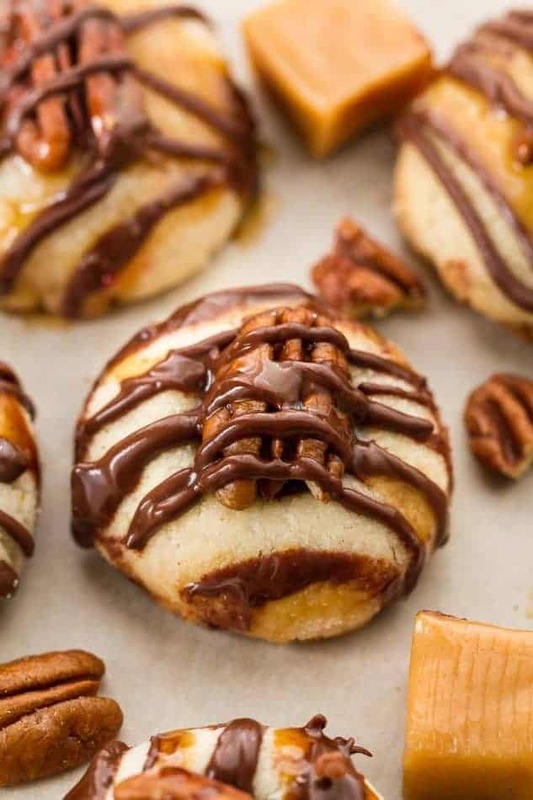 For these turtle thumbprint cookies, fill with melted caramels, top with a pecan half and drizzle with chocolate and caramel. You can check out the full recipe HERE. 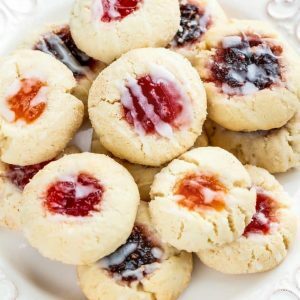 5 Ingredient Shortbread Thumbprint Cookies – my favorite dough for making these classic cookies! There’s NO spreading or CHILLING required!! 7 fun ways to decorate perfect for your holiday cookie platter! In the bowl of a stand mixer or using a hand mixer on medium speed, cream butter and sugar together until smooth and creamy (about 5-6 minutes). Mix in vanilla and beat until combined, scraping down the sides and the bottom of the bowl as needed. Turn mixer off then slowly add in cornstarch and flour. Turn mixer back on low and beat until the dough starts to crumble and clump together. If dough seems too wet - add more flour (1 tablespoon at a time up to 2 tablespoons). If dough is too wet, add 1-2 teaspoons milk. Turn mixer off and gather the dough with your hands to press the dough down and together while kneading and squishing the dough with your palms to form a big ball. This might take about 2 minutes. The warmth from your hands will soften the dough and form together. 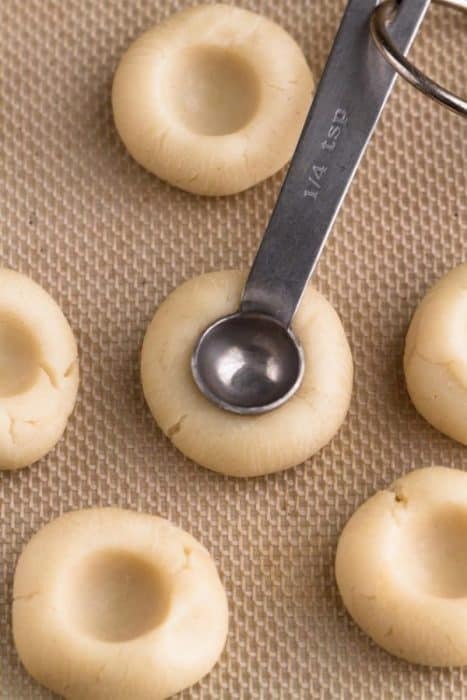 Pick off 1" pieces and roll and squish tightly into round cookie dough balls (you can roll them in granulated sugar for an extra crunch and sheen if desired) and place about 1.5" apart onto prepared baking sheets. 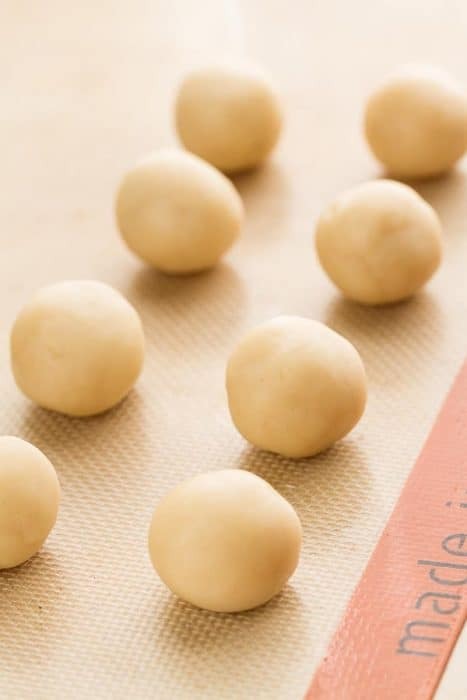 Make an **indentation with thumb or using a 1/4 teaspoon in the center of each dough ball. Bake in preheated oven until set but still pale & not golden, about 10 - 12 minutes. Be careful not to overbake, as the cookies will continue cooking as they are cooling. Remove from oven and indent center again if necessary. Dough will continue to cook as it cools. Allow to dry on the baking sheet for 5 minutes then transfer to a wired cookie rack to cool completely. Fill with your favorite jam or decorate with choices below. Hershey's Kisses thumbprints: once the cookies are baked and hot out of the oven, immediately press a Hershey's Kiss into the center while the cookies are still warm. Do not move and allow to dry. The Hershey's Kiss will stick to the cookie once it is dry. 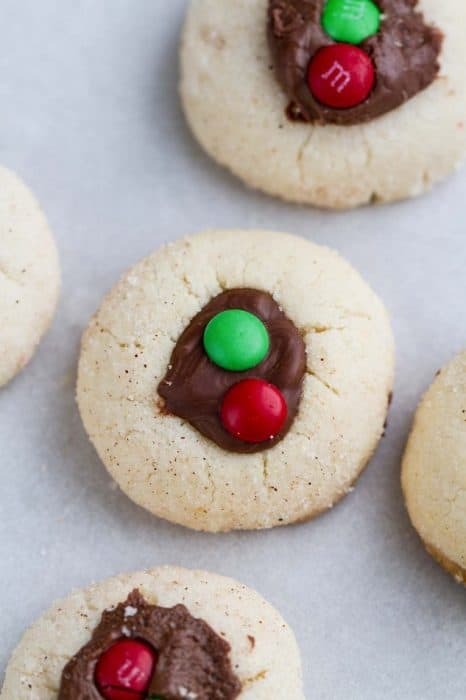 For the Nutella M&M's cookies - allow baked cookies to dry then fill with Nutella and top with festive mini M&M's. 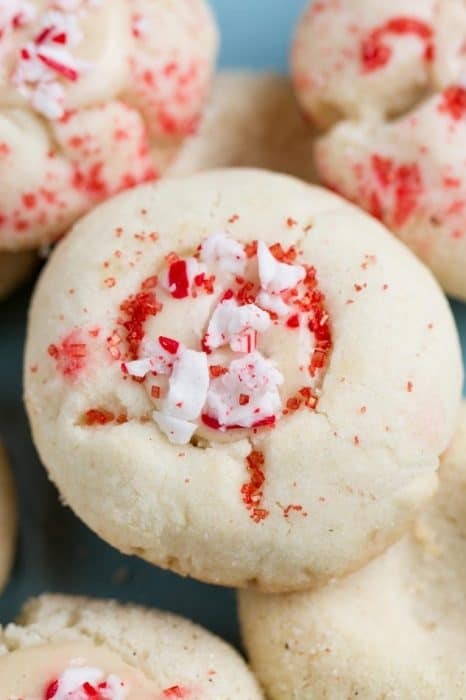 For the white chocolate peppermint cookies: Allow baked cookies to dry then fill with melted white chocolate and top with crushed candy canes. Allow to set. For snowmen cookies: Once cookies are baked and still warm, immediately place a white chocolate melt in the center and bake in the oven for an additional 1 minute just until the chocolate melt sticks to the cookie. Then immediately decorate with blue sprinkles for the eyes, 1 orange jimmies sprinkle for the nose and top with cut black licorice pieces for the eyes and mouth. If the sprinkles and licorice do not stick, place back in the oven for another one minute so they all stick. Remove from oven and allow to dry and set. **For Rudolph cookies: instead of pressing an indent in the middle when you bake the dough, flatten the dough balls with a glass and then stick on the broken pretzels to form the antlers. Once the cookie is baked, immediately press with a Red Smarties' candy for the nose and cut black licorice pieces for the eyes and the mouth. **Do not make an indent for the Rudolph cookies. Instead, flatten the dough balls with a glass and then stick on the broken pretzels to form the antlers. Once the cookie is baked, immediately press with a Red Smarties' candy for the nose and cut black licorice pieces for the eyes and the mouth. ***PLEASE NOTE THERE IS NO BAKING POWDER IN THE RECIPE AS YOU SAW FROM THE VIDEO. THAT WAS A TYPO & I APOLOGIZE FOR ANY CONFUSION. 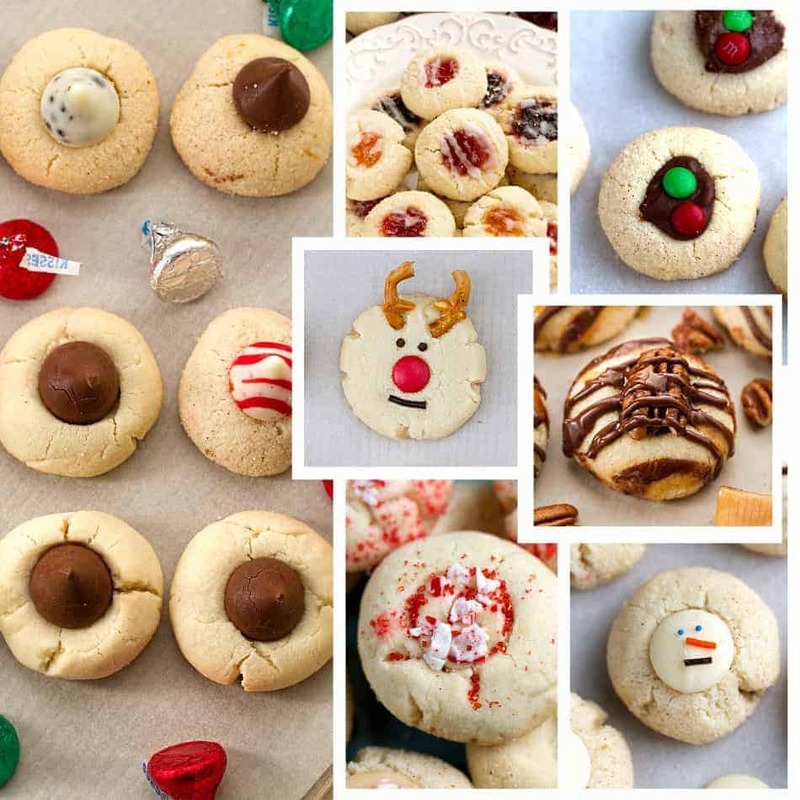 Follow Life Made Sweeter’s board Cookies on Pinterest.